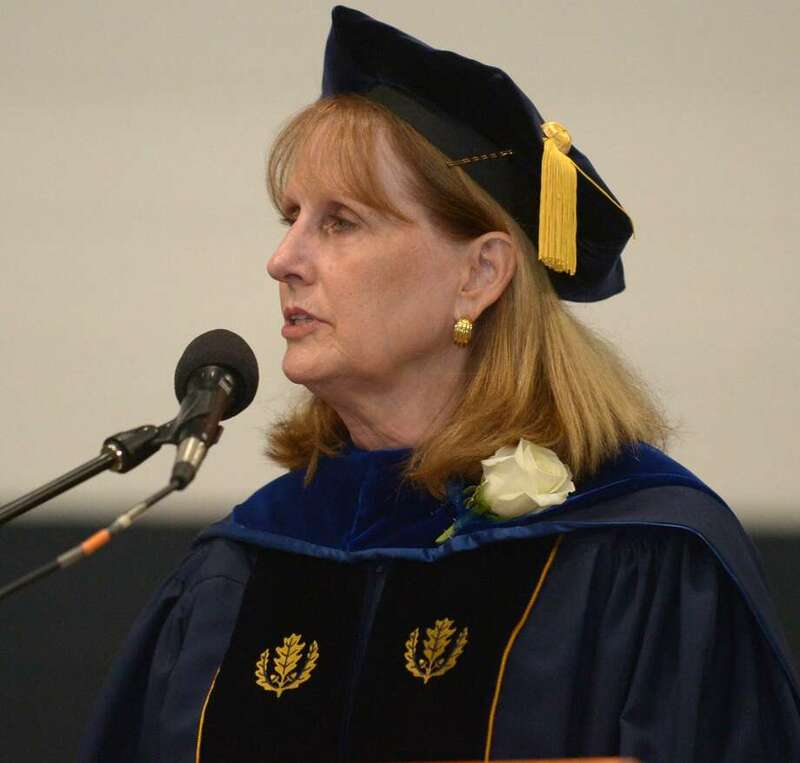 Superintendent of Schools Dr. Colleen Palmer speaks to the graduates during the Staples High School Class of 2018 commencement exercises Friday, June 22, 2018, in Westport, Conn.
WESTPORT — Police and school officials dominate the top 10 spots on the list of highest-paid town employees for 2018, according to recently released data from town hall and the schools’ central office. Superintendent of Schools Colleen Palmer topped the list with $300,411 in salary, plus a $4,293 annuity and $13,804 in vacation compensation. Her salary exceeds that of current Fairfield Superintendent Toni Jones, who had a 2018 salary of $236,640. The 2018 salaries of the Darien and New Canaan superintendents of schools have not yet been released, but their 2017 earnings, at $269,496 and $262,248 respectively, were both lower than Palmer’s 2017 salary, which stood at $288,562. Board of Education Chairman Mark Mathias defended the high pay of Palmer, especially compared to the other Connecticut District Reference Group A school systems in Darien, Easton, Redding, New Canaan, Ridgefield, Weston and Wilton. “Every year the Board of Education reviews the compensation. In particular, we take into consideration the superintendent’s years of service and the fact that Westport is the largest district in DRG A which requires a specific skill set,” Mathias said. Besides the superintendent, Schools Chief Financial Officer Elio Longo with $249,486, Staples High School Principal James D’Amico with $200,370, and Director of Human Resources John Bayers with $190,600 in total earnings represented the educators, taking the third, ninth and 11th spots on the list. Of the top paid employees of the Westport police department, Cpl. Howard Simpson placed second on the overall list with gross wages of $270,729 compiled from his base salary of $89,163, in addition to $100,175 in overtime. That includes pay for working holidays and stipend and differential pay for working the overnight shift, and $81,391 taken home for outside duty work. Of the six police department employees included on the top 10 list, the lowest earning person, Police Lt. David Wolf, took home $190,712 in gross wages last year. “This is still a relatively small percent of the organization that makes that kind of money. It doesn’t speak to the entire organization. It’s officers that have made the personal decision to not hold other jobs and work overtime because they have kids in college or personal investment and work lots of extra hours for that income,” Westport Police Chief Foti Koskinas said. Koskinas said Westport is staffed to have 64 officers at a time, but that number varies depending on employees away for retirement, medical leave or personal reasons. When the staff is lower, more overtime opens up for other officers to fill, Koskinas said, noting it’s less expensive to pay an existing officer overtime than to hire additional officers which come with vacation and health care costs. Outside duty is paid for by entities, such as construction vendors, faith organizations or utility companies who need security assistance, unlike overtime pay which comes from the town’s budget, Koskinas said. Despite the long hours of some police employees, Koskinas said the department has policies in place to prevent officer fatigue. “We have a very strict rule that everyone adheres to that you can’t work more than 16 hours in a 24-hour period. We take it seriously that officers get adequate rest and get to go home,” Koskinas said.